Enjoy these old fashioned ice cream topping recipes from the days of the ice cream parlor. Homemade and all-natural, these sauces give you a healthier alternative to the store-bought variety, and they taste so much better too. Time and money will be saved if only one day's supply is made at a time. Be sure to cover and refrigerate toppings until ready for use. 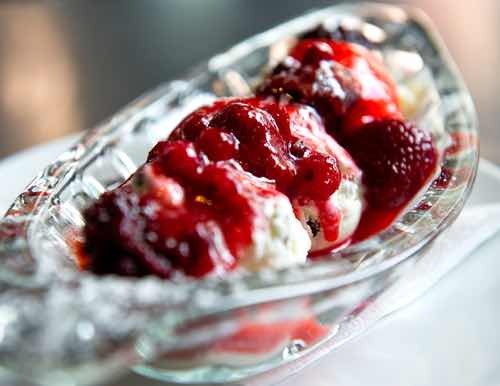 Over a serving of vanilla ice cream pour a ladleful of hot crushed strawberries. Do not let the crushed fruit reach a boiling degree as the heat will tend to destroy the delicate flavor. Make a thick, smooth paste with powdered cocoa and hot water and add simple syrup until the correct consistency is obtained. Pour over vanilla ice cream. Vanilla syrup may be added in this formula for flavor. For this ice cream topping recipe, chop 1 pound of mixed nuts and add 10 ounces crushed strawberry and 10 ounces crushed pineapple sauce. Pour over plain ice cream or your choice. Mix one cupful of powdered chocolate with 3 cupfuls of simple syrup. Let the mixture come to a boil, then beat in 2 dozen marshmallows. When about cold, add one cupful of walnuts chopped not too fine. To serve, put one scoopful of vanilla ice cream in an ordinary sundae dish and pour over the cream one ladleful of the chocolate marshmallow nut mixture. If desired, a maraschino cherry may be placed on top of the mixture to give it a more attractive appearance. Into a silver sundae dish put two scoopfuls of vanilla ice cream and add a ladleful of "Dixie Dessert Syrup." Top with whipped cream and a cherry. Mix into a paste 1 pound of peanut butter and 1/2 pound of cocoa by gradually adding 3 quarts of cold water. When the mixture is rubbed up smooth, add 2 ounces of butter, and slowly heat until it boils; dissolve in it 3 pounds sugar and set away to cool; then stir in 2 ounces of vanilla extract, and the mixture is ready for use. For this ice cream topping recipe, boil one cup each of sugar and water for five minutes. Melt half a pound of unsweetened chocolate and add to sugar. Season with one teaspoon of extract of vanilla. Peel 6 oranges, cut up in blocks; 1 grated coconut; 12 ounces crushed pineapple. Mix well; serve over favorite ice cream. Put into a pan one quart of good marshmallow sundae syrup and color pink with a few drops of red food coloring. Add 6 or 8 ounces of ground nuts and mix well; then add 4 ounces of figs previously cut fine and again mix all well together. Add half a cup of orange marmalade to one cup of marshmallow topping. Beat smooth. Beat the whites of four eggs stiff, add one cupful of boiling hot maple syrup, and beat vigorously with a spoon. Cool and add to the mixture one cupful of cream. Whip the mixture with an egg beater, adding, if desired, chopped nuts. One pound honey, 1 pound granulated sugar. Cook to a boil and add the well-beaten whites of one dozen eggs. Beat for 15 minutes and add an ounce of vanilla extract. A very white, creamy whip, and a great favorite. The homemade ice cream topping recipes below were discovered within a charming article published in a 1940s girl's magazine now in the public domain. 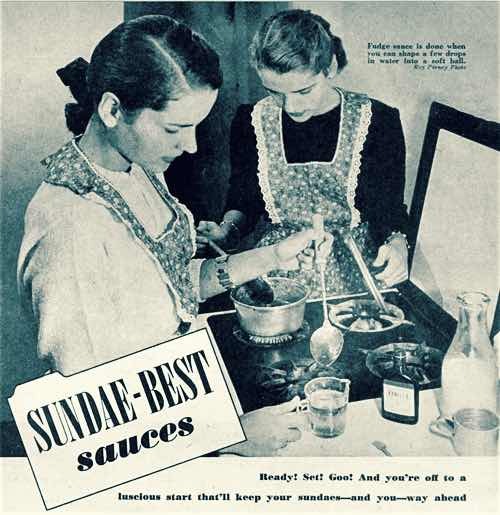 It seems a group of schoolgirls found a way to enjoy their love of ice cream while saving money for fashion accessories by starting a Sundae Club and inventing their own sauces. It all began because of a belt. An absolutely sensational belt; pigskin, almost 5 inches wide, and studded with nail-heads. Seems like a funny reason for starting something called a Sundae Club, but Gail simply had to have that belt. The bank account said no. She wouldn't have a birthday for years, it seemed. It was Gail, moaning about that belt who really began it. It seemed Cathy wanted a sweater, Ellen a pair of flats, and Nobby a pen she claimed would write under soda water of any flavor. Everybody knew where their money went — movies and a place called the Tuck Shop. They could think of no homemade substitute for Alan Ladd, but they certainly could learn to pour goo over ice cream themselves and save money that way. So — the Sundae Club was born. On Mondays at recess, the club held sessions to decide the sundaes for the week. All the mothers pitched in, bought what was needed to make the sauces, and often treated the girls to it. The girls bought and brought home the ice cream (it's cheaper in bulk 'cause it goes further). They rotated houses so they wouldn't get in people's hair — and they chipped in on the sugar, checking first with their mothers on the state of the rations. And boned up on cookbook recipes. It took research, but here are some of their pet finds. This is really nothing but thin fudge. Put into your saucepan 2 cups of sugar, a pinch of salt, 2 squares of unsweetened chocolate, 3/4 cup of milk, and 1 tablespoon of butter. Heat this mixture slowly, stirring constantly till the sugar is dissolved, the chocolate melted, and the mixture ready to boil. Then cover and let it boil for 2 minutes. Uncover and keep it at a slow boil till a couple of drops in a cup of cold water form a very soft ball when you gather them together with your fingers (or until the heat reaches 230° F. on the candy thermometer). It's a good idea to go on stirring during this boiling — perhaps not constantly but pretty often. The milk and chocolate make a combination that sticks and burns much more easily than most syrups. Now take it off the fire, let it cool a little, add 1/2 teaspoon of vanilla, and beat it until the sauce shows signs of thickening. This will give about 2 cups of sauce that can be served hot or stored in the icebox and used another day. If you serve it hot after it's been chilled, reheat the sauce slowly. Make your caramel by melting 1-1/2 cups of sugar in a heavy frying pan over low heat and letting it cook till it is golden brown. This is a surprising business — you'd never think that pile of sugar would turn into caramel syrup all by itself. Then remove it from the fire and dilute it with 1 cup of boiling water. Stir till all the syrup dissolves off the sides and bottom of the pan, then add 1 tablespoon of butter and return it to the fire. Keep at a slow boil until a few drops will form a very soft ball when dropped into cold water (or when the heat of the sauce registers 230° F. on the candy thermometer). Take off the fire, cool a little, add 1/2 teaspoon of vanilla, beat till it begins to thicken, and you have 1 cup of caramel sauce. This, too, will keep a day or two and can be used hot or cold.